Stephan Mantler, a mountain guide and owner of Icelandic tour company, captured the whole ordeal on camera. Tourists were admiring the Breiðamerkurjökull glacier in Vatnajökull National Park in southeastern Iceland. This area is only accessible with a trained mountaineer, according to Mantler. Mantler said he could hear the cracking from the far-off glacier, which is a sign that a glacier calving – the natural process in which a large section of ice breaks away – was imminent. With his client safe, he pulled out his phone and started recording, but kept his eye on the other group of tourists below. "I could see all of them start to move out of harm's way and their guides also ready to jump into action if necessary, so I kept recording but with a watchful eye on people's movements, "Mantler said. 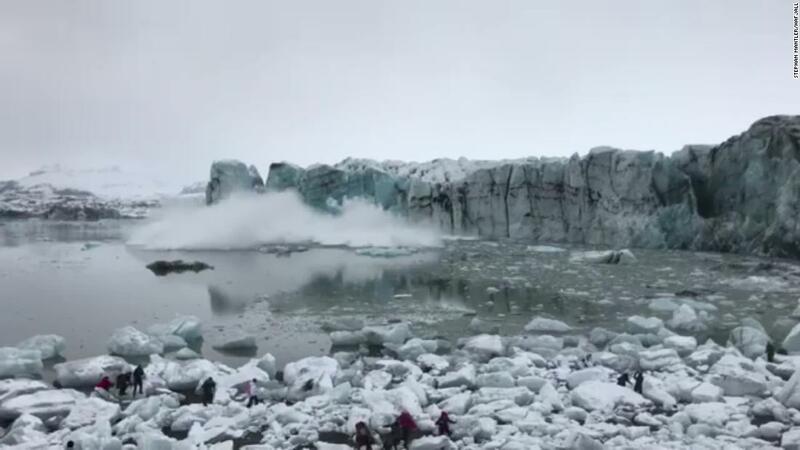 In the video, you can hear rumbling that sounds like the pieces of the glacier crash into the water below. People start running to higher ground as waves approach them. "While calvings are fairly frequent at this time of the year, this was an extraordinarily large event and much closer to the shore than usual, which is why it was such a close call, "Mantler said. "In the end, most importantly, nobody got hurt or even law." He said everyone was briefed about what to do in case of calvings before they head out on their adventure.